is a community of artists actively learning about and creating artist books in Fairbanks, Alaska. The Guild promotes all aspects of book arts through education, participation in exhibitions, and community outreach. NBG is affiliated with the North Star Community Foundation. The Foundation serves as our fiscal agent. All monetary transactions on our site, including membership and donations, are re-directed to the NSCF site in a new window. Our Studio is located in the Caribou Building, Suite 205 at 3550 Airport Way, Fairbanks, Alaska 99709. “Paper Birches”, our cooperative supply inventory, is also located there, as are most of our classes and workshops. Coptic binding is one of the classic techniques for a bookbinder. Whether you are new to the technique or need a review, this workshop will cover the basics as we create a small but elegant notebook. 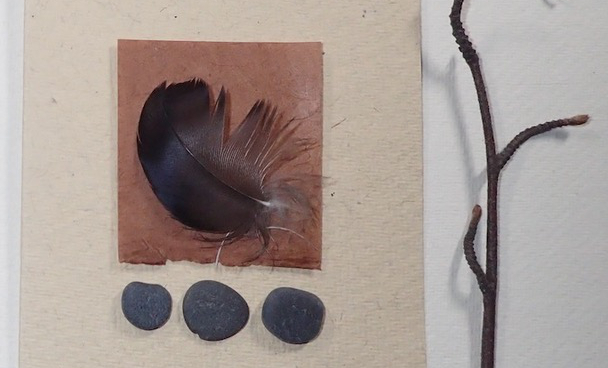 Join the NBG on September 9th to create cards using natural materials guided by Connie and Susan. Back by popular demand! This handy, one-of-a-kind notebook is perfect for holding NBG meeting and workshop notes, tracking progress on your New Year’s resolutions, sketching ideas for future projects, or collaging artful papers and images. The notebooks, with pages measuring 7.25 x 4.5″, will be bound with 1-inch spiral coils. Explore the elusive creative space between the careful and the wild as you create an accordion-folding book. Native flora will be used as inspiration for drawing, painting, and writing in both traditional and non-traditional ways. Directed experiments using watercolor, ink, and gouache will develop imagery and content, full of autumn magic. Come and learn this easy and functional structure! This book has a concertina binding with 5-hole pamphlet stitch, and a cover that wraps around, all without glue! The book is great for journals, photo albums, and sketching. Have a workshop idea to share? Interested in instructing? Want to suggest a new book exchange theme? Complete the online survey and let us know! Join us for a scheduled workshop or class! Contact any NBG Board member if you have an idea for a class you would like to lead or to take. Scholarships are available for NBG members to cover bookmaking workshop instructional fees. Apply by completing the Marilyn Askelin Memorial Workshop Scholarship Request Form (docx or pdf). “Paper Birches,” our Guild book arts supply program, is open at the NBG Studio located in Suite 205 at the Caribou Building, 3550 Airport Way, Fairbanks, AK 99709. Supplies may be purchased at Open Book events, meetings, and workshops held at The Folk School. You may also contact any Guild Board member to make an appointment to meet at the studio. NOW IN STOCK: BFK Rives, Arches text wove, Shizen and Khadi papers; book board and piercing cradle kits; metal measuring edges, linen tape, and folder stock; MacTac and Jade 403 PVA adhesives; waxed linen thread by the spool or by the yard. Let us know of materials or supplies that you’d like to have available to you– by buying together we can take advantage of bulk discounts and save on shipping. This makes it possible to spend more on beautiful papers!